The benefits of Paintless Dent Removal? Mobile Paintless Dent Removal in Nottingham, Derby, Matlock, Loughborough, Southwell, Belper, Newark & Mansfield from Dents First. 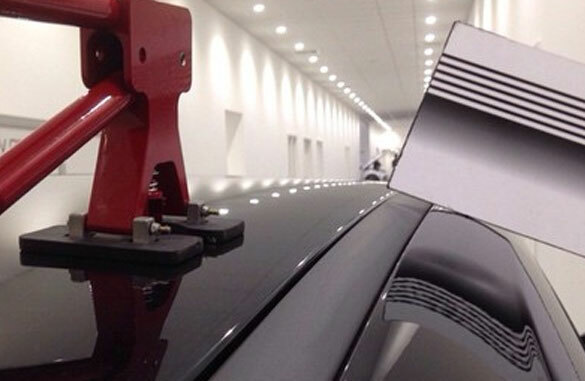 Dents First are experts in the repair of dents and dints in vehicle body work using Paintless Dent Removal (or ‘PDR’). Based in Nottingham we work across Derbyshire and The East Midlands and have been repairing dents in cars and light vans since 1997. Our customers include the general public, the motor trade and businesses running fleets of company cars. All our workmanship is fully guaranteed. Dents are carefully removed by inserting rods behind the damaged panel and skilfully working the metal back to its original shape without damaging the exterior paintwork. This form of repair is invisible and restores the vehicle to its true original condition without the use of fillers and after market paints. Provided only that the original paint finish remains unbroken, Paintless Dent Removal can be applied both steel and aluminium body panels. This makes it suitable for almost all makes and models of cars and light vans both new and old. PDR can be used on dents up to around the size of a football. Some 90% of the total vehicle bodywork area including bonnets, doors, tailgates, front and rear wings and roofs (including hail damage) can be repaired in this way. Paintless Dent Removal is quick and can be carried out at your home or place of work at a time convenient for you. Repairs are invisible and don’t carry the risk of poor colour matching or overspray that can result from traditional respraying. Better still, a PDR repair can be up to a whopping 85% less expensive than a traditional body shop would charge- yes, a potential 85% saving on your repair cost! In fact, PDR is so economical that it can often add more to the value of your vehicle than the price of the repair itself. These are just some of the many benefits of Paintless Dent Removal. Adey Shaw AMIMI, the proprietor of Dents First, has been carrying out PDR repairs since 1997 and has been in the motor trade for even longer both as a mechanic and as a body repair technician. He is one of the UK’s leading experts in his field and his customers’ glowing testimonials are confirmation of this. In recognition of workmanship and customer service, Dents First is today a member of PDR UK an invitation only industry group of Paintless Dent Removal experts. Only PDR technicians working consistently to a very high quality, providing excellent and ethical service to their clients and offering value for money are invited to join. Always ask if a repairer is a member of PDR UK before engaging them.